Abraham Maslow's Hierarchy of Needs pyramid. 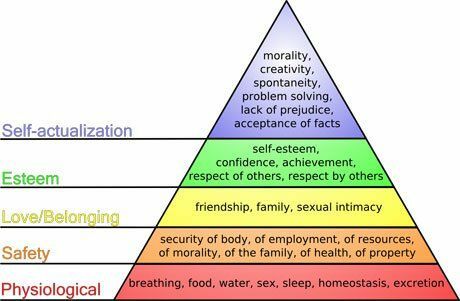 The bottom two levels reflect basic needs, the next two reflect psychological needs, and top reflects self-fulfillment needs. In the mid-1950s, humanistic psychologist Abraham Maslow created a theory of basic, psychological and self-fulfillment needs that motivate individuals to move consciously or subconsciously through levels or tiers based on our inner and outer satisfaction of those met or unmet needs. As a parent and educator, I find this theory eternally relevant for students and adults, especially in our classrooms. After studying it over the past couple of years, my graduate and undergraduate students have decided that every classroom should display a wall-sized diagram of the pyramid, as students and teachers alike place pins and post-its on the varying tiers based on their own feelings, behaviors and needs. What do actual brain-compatible strategies look like on this pyramid? Water bottles and water breaks. Focused attention practices: These practices, involving breathing, imagery and sound, last one and a half to two minutes as students close their eyes or focus on an object of attention, practicing quieting their minds from the free-flowing thoughts that bombard our thinking every day. Physical surroundings: These include room arrangement, color, temperature, plants, etc. Food: Provide a mixed snack bar and have the class designate times to grab some energy bites and continue working. These elements contribute to brain-compatible learning by creating a physical environment that is inviting, warm and friendly! How much water have I had over the past 24 hours? Is it enough? What resources (people, activities or experiences) could assist me in reaching my small and larger physiological and psychological goals? Attitude: Sometimes it is enough to have a personal affirmation that creates feelings of safety and security. For example: "Right now in this moment I am safe. I am breathing, I am aware, awake and I can think and feel!" Worry drop box: As you enter the room, drop a written concern in a box situated by the door. Research shows that writing out our concerns and worries frees up the working memory and relieves anxiety. Pin-ups: The class assigns various students to physically post a compliment or affirmation each day. We all need to feel validated and often lose sight of our strengths and talents because the brain is wired with a negative bias. These pin-ups help us focus on positive experiences and behaviors instead of faults and mistakes. Common experiences: Develop class guidelines together. Create a class blog. Invite outside speakers that promote service and safety: police officers, counselors, former students who have risen above difficult situations, etc. Celebrations: Create special and celebratory days all year long: birthdays, VIP days, strength day, progress days, colorful days, etc. Community circle: For 3-10 minutes at the beginning and ending of class, share a time where empathy is defined, discussed and brought to life. You might also share movie clips, personal narratives, or a story to jumpstart the day. Identity: A classroom theme, flag, song, flower and animal totem. How do I handle negative situations? When these situations occur, what do I typically say to myself? What statement would encourage me? What are three negative emotions I feel most often? What are three positive emotions I feel often or sometimes? For students to feel capable and successful, we must create an environment that lends itself to this type of mastery. Expert Day: Students get to demonstrate personal expertise. Career Day: Bring in college students and community members to share the possibilities of academic and professional success following high school. Display skills as a class: Create and design quizzes, assignments and instruction for students in other classes and grades. Who are my heroes? What character traits do I admire that make them my heroes? How will I know I am on the right track? What will tell me if I stray from pursuing my goals? How will I focus on these strengths knowing that my thoughts and feelings drive all my words and actions? This is level of self-evaluation related to service. We begin to explore and model, designing, evaluating and analyzing information outside of our own basic needs, serving others. To become creative thinkers, we have to begin discovering the problem, not just coming up with a solution. In this tier, students become self-assessors and self- reflectors. They are able to see and understand how their actions, thoughts and feelings affect all lives. What are the challenges in reaching my purpose and the lives of others? How can I serve the world? Why is there conflict and war? What can I do? What can we do? Have you ever encouraged self-examination and self-reflection among your students? Please share your experiences in the comments section below.